Spotlight on Girls: Circles of Support Speakers – Working Group on Girls of Schenectady, Inc.
At our recent Circles of Support event, we were joined by two Schenectady High School students who have participated in our programs, Mylika Rozier (right) and Shamiah Walker (middle) from Central Park. 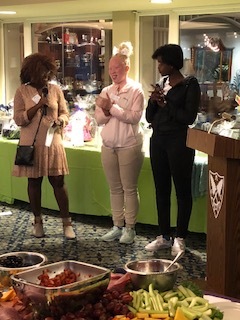 Both girls expressed surprise at the care and support that they’d found, and they both particularly noted how impressed they were by how the adult volunteers modeled this caring and support for each other as well as the girls at events. Clearly, they’d absorbed these values, like when Mylika opened her speech announcing, “You all look amazing today.” In addition, Shamiah shared a poem that you can find here. Here are some excerpts from their speeches.